It's about time I have a recipe post for you all! Can we say...slacker? To be honest, I don't bake or experiment much in the kitchen in the summer. The nice weather always take precedence. Dinners are typically rotated a lot or we are grilling out, so there's not much to share recipe wise, but it seems like once fall rolls around I always want to try new things in the crock pot and bake up a storm. It's those crazy fall flavors that do it to me! 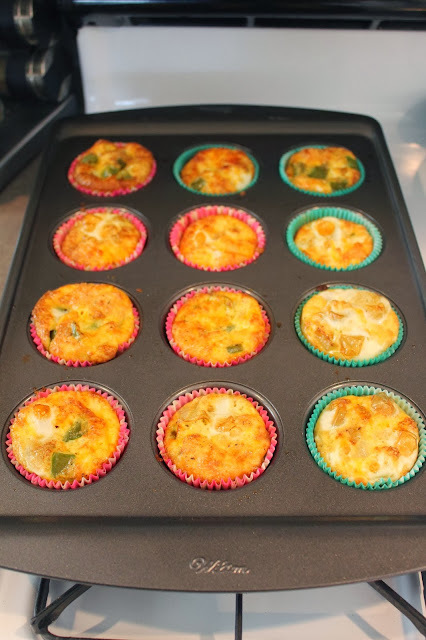 I made these egg muffins for the engagement party on Sunday, but they are truly perfect for those looking for a breakfast that is already prepared ahead of time and all you have to do is heat it up the morning of. If your ideal breakfast description is quick, easy, or to-go then you will be a fan of these. You can make these in advance (still not very time consuming - very easy! ), store in individual containers/bags, then pop in the microwave! It really is that easy, friends. Preheat the oven to 375 degrees. Place 2 paper muffin cups into each of the 6 holes in your muffin pan. Make sure you use 2 otherwise the egg can soak through. Spray the inside cups generously with cooking spray. In a pan, saute the onion and peppers over medium heat for 3-4 minutes. Just long enough so the onions start to get soft. Divide the veggies evenly between each muffin cup, then top with a little cheese. Whisk all of the eggs together with salt and pepper in a bowl. Pour egg into each of the cups so they are about 3/4 full. Then, use a fork to carefully stir all the ingredients in the cups together. Bake at 375 degrees for 30-35 minutes, or until the muffins have risen and the tops just barely start to brown. Like I said up top, I made these later with no cheese and also with egg whites and they are just as good. I actually prefer the egg whites because I have a little yolk allergy that most of the time I don't pay much attention to, but hey-life's short. 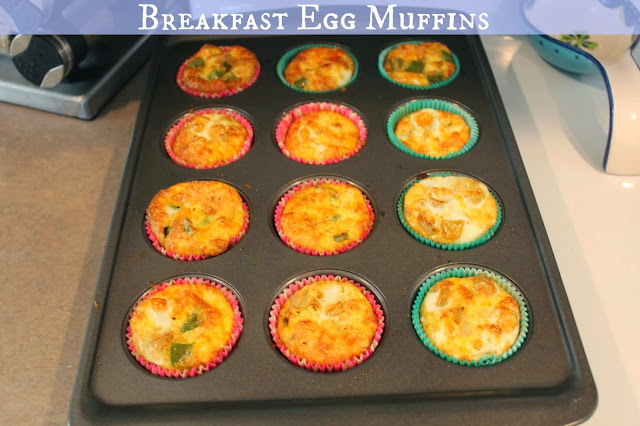 Have you made egg muffins before? I'm definitely going to try these! They look so yummy! I've made something similar to these, & they're so good! I love these! I put the extra ones in the fridge and then heat them up for a few days for a quick mini omelet. Yummo! Yumm! Sounds soo good!! I know you don't eat meat but, if you wanted to go another step you could add in some all natural breakfast sausage - brown & then add in the pepper & onion. Or something like that! I will definitely have to keep this recipe in mind though as it does break up the pre-made eggs & sausage that we make on Sunday's for the work week breakfasts! I've made these before, but I've used hashbrowns, eggs, cheese, and bacon! OH yum!! Such a great idea for brunch or hosting a shower! Gotta make these soon! Yum! I love making something similar to these with egg whites! So easy! I've made these before as well. All I added was sausage cut up in little bites, cheese and the egg beaters in the carton. A little pepper and boom! Perfect breakfasts. Definitely put them in ziploc bags and popped them in the microwave. I make these every week but I omit the actual paper wrapper it uses up more egg when peeled apart.. I also don't use cheese you can't even taste it and I only use egg whites from the egg beater company! They are delish! I want to make these, I'm just lazy! They look delish! I have made some egg muffins before, but using a different recipe. They were a huge hit with the other half! So huge, that the one that slaved over making them (yours truly), never even got to try one. oh my goodness i cannot wait to try this!! I will be trying these for sure! Thanks for sharing! And now I know what I wish I had for breakfast! I've never tried making egg muffins, but have always wanted to. How long do they last in the fridge? My boyfriend would totally love these.